The world over there is a lot of focus on weight loss. There are strength training and yoga programs, online diet plans and supplements which are available. Many could be useful for you. Some may not be. One can only try out and see what works for you. Also, what works for one individual need not work for another individual. So there is no common standard as such. The only discipline which works for hundred percent of all people, is Yoga. Whichever form of exercise or routine you decide to take up, you need to know how it works and what is the impact on the body. 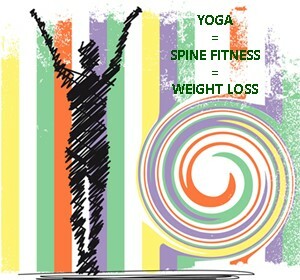 The main part of the body which is crucial for physical fitness, internal health as well as weight loss, is the spine. The entire portion starting from the base of the brain at the back and going right down to the upper tip of your buttocks, is the backbone or the spine. We must remember that any exercise we do, this should not get strained a lot. When all these are done on a daily basis, the spine becomes supple and flexible. It improves body metabolism and can take on much more load, facilitating weight loss. It has been found that obesity and back or cervical problems are linked. If you are sedentary and do not exercise your spine, you start putting on weight and also get aches and orthopedic problems. You may have also noticed that over weight persons sooner or later have some back or cervical related problem. This enhances other ancillary problems like sciatica and arthritis. To break this cycle, even if you are already over weight, start working on the spine first. The rest will automatically follow. Begin with gentle stretches of four types – upward, sideways, twist and backward. When you are fitter, you could start forward bends and much later, you may try inversions. With this, start walking as much as you can. Walk in the morning or evening like an exercise. However, also be on your feet as much as you can. Walk when you talk on the phone or while doing chores. If you take public transport, get off one station or stop before and walk to your destination. A combination of stretching and walking is excellent for both; spine health and weight loss. Tadasana or the palm tree pose. Tiryaka Tadasana or the swaying tree pose. Konasana or Trikonasana or side bending poses. Toe touching or angle pose. Standing Bhujangasana (cobra pose) & Standing Salabhasana (locust pose). Standing, seated or lying down Vakarasana or twisting pose. All of these can be done in a sequence three times a day on an empty stomach; before breakfast, before lunch and before supper. You could do them at your desk or at home. When you are doing standing poses, you do not need any mats, equipment or special clothing. If you need some guidance and a good routine to practice on a daily basis, you should check out the office fitness routine and practice it daily. It is a great beginning to healthy and long term yoga for weight loss.